east of Rose Hill (Parramatta). 1810 150 acres set aside for an Orphan School at Arthur’s Hill encompassing the former Arndell estate. 1813 Tenders for timber and bricks were called. 1813 September 24th Governor Macquarie formally lays Orphanage Foundation stone. 1814 Brickwork and roofing nearly completed on main building. 1816 Mrs Macquarie appointed Orphanage Patroness. 1817 School stated to be complete. 1818 30th June Government boats deliver 70 girls, and Matron and Master to Orphan School. Governor limits number of girl residents to 100. First extension of east and west wing commenced. 1819 Site still requires out buildings, bakery and stables. 1820 Plan of improvements corrected and approved; Francis Greenway to advertise for contracts to construct Matron’s room and school room. 1821 Mrs Macquarie requests extra improvements including projecting outside caps for school room windows, hut and gardener, and workman’s hut. 1822 Very little work done on buildings, Watkin to be sued and Mr Smith to estimate cost of completion. Greenway’s services to be dispensed with, and painting and glazing tenders requested. 1823 Smith presents bill for his completed work. Buildings to be “whitewashed”. 1825 Insufficient supply of water noted, poor drainage and brick arches said to be dangerous. Pine joinery decaying. Room in east wing adapted to laundry, store converted to washing house and brick wall built in playground. December work said to have “considerably progressed”. 1826 Payments were made for 2180 ft. of chiselled flagging, the veranda in the rear of the main building, brickwork in the servants’ rooms, stables and corn house, window sills and carpenters’ work. 1827 Engine House plans prepared by Busby and Brown. Fire in chimney damages roof. 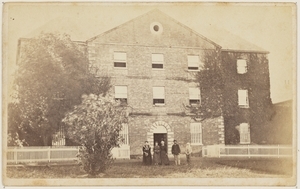 1828 The “new building” intended to house male and female orphan schools, although the co-educational scheme was not proceeded with. 1829 Tender for new kitchen and three cells adjoining submitted. 1830 Repairs to boat house and a tender for a wharf called for. Extensions to the east and west wings were made. 1831 Dam completed on site. Repairs to cesspool, drain and gutters completed. 1833 Building referred to as “hansom and commodious”. 1840 Whitewashing completed on main building. 1850 Male Orphan School at Cabramatta closes and boys are moved to the Female Orphan School at Parramatta. 1854 Orphan School Hospital and sheds erected. 1865 Drill Master’s residence likely to have been built. 1870 Plans for additions to hospital veranda, bathroom and school rooms submitted. 1877 Roof stated to be in “bad repair”. 1882 forty bed dormitory added to west wing. 1888 Buildings handed over to department of Lunacy, and become the Parramatta Hospital for the Insane. 1892 Stable for Medical Superintendent (wooden) shingled and terra-cotta erected. 1893 Survey of site completed. 1894 Front porch rebuilt on main building. 1895 Boat shed and landing area constructed. 1904 Balustrade added to wings to make two levels. Second storey added to school block. 1905 Additions to Central block – back stairs added, connecting passageways to both wings. 1907 Water closet and enclosed veranda to orphan school buildings. 1931 Second floor added to block adjoining east wing. 1954 Additional level to back stairs block on centre wing to allow for hot water system boiler in shed at its base added. 1980 The psychiatric hospital vacates premises.